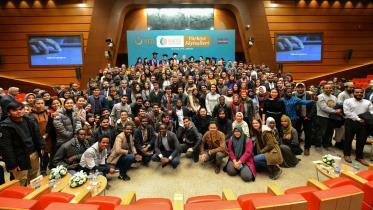 The first of the series of “Türkiye Talks” of the International Student Academy was organized by Türkiye Scholarships in Ankara with its first speaker Associate Professor İbrahim KALIN, Presidential Spokesperson to the Turkish President. KALIN pointed out to the fact that there are students from more than 100 different countries among his audience, which he stated is a great riches and diversity. “Everyone's culture, language and history is valuable in the name of humanity. From a Eurocentric perspective, all non-European cultures are treated as second class. However, we know that human civilization and the march of humanity can become meaningful only when we embrace all cultures, languages, and histories. With this vision and view, there are 125 thousand international students in Turkey and our target for 2023 is 200 thousand international students”, KALIN added.